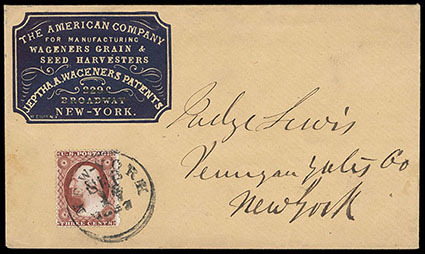 (Cameo) The American Company, For Manufacturing Wagners Grain & Seed Harvesters, blue cameo corner card on cover franked with 1857, 3¢ dull red tied by "New York, Sep 17, 1857" cds, Very Fine. Scott No. 26 Estimate $100 - 150. 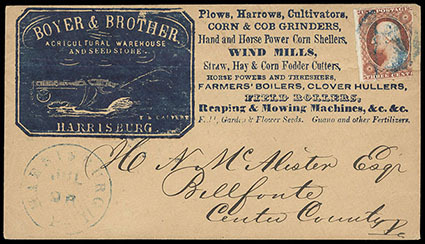 (Cameo) Boyer & Brother, Agricultural Warehouse, Harrisburg, blue illustrated corner card showing Plow with additional ad text at right, on cover franked with 1851, 3¢ orange brown, type I (in at right) tied by blue cork handstamp, matching "Harrisburg, Pa., Jul 26" cds, Very Fine. Scott No. 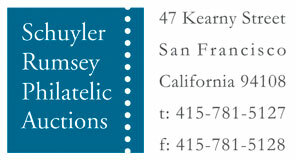 10 Estimate $150 - 200. 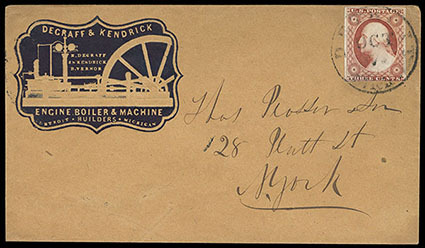 (Cameo) Degraff & Kendrick, Engine Boiler & Machine Builders, Detroit, Michigan, illustrated embossed cameo corner card design showing Steam Engine in blue on cover to New York, franked with 1851, 3¢ dull red, type II, three line recut in upper left triangle tied by neat "Detroit, Mich." cds, Very Fine and choice; with 2018 P.F. certificate. Scott No. 11A Estimate $300 - 400. 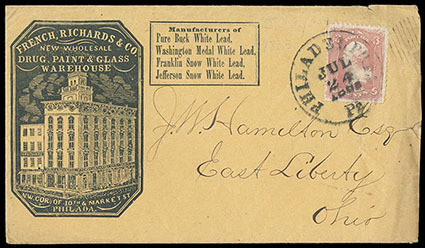 (Cameo) French, Richards & Co., Drug, Paint & Glass Warehouse, Philada., blue illustrated design showing Warehouse View, on cover franked with 1861, 3¢ rose tied by "Philadelphia, Pa., Jul 24, 1862" cds and grid duplex, additional ad text on reverse and original enclosure; cover with a couple of small tears, otherwise Very Fine. (Cameo) G.S. 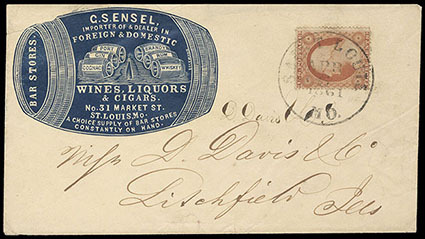 Ensel, Wines, Liquors & Cigars, St. Louis Mo., blue illustrated embossed cameo in barrel shape showing barrels of liquor and wine, on cover bearing 3¢ dull red (@6) tied by "Saint Louis, Apr 6, 1861" cds to Litchfield Ill.; top edge repaired and no back flap, Very Fine appearance. (Cameo) Gust. 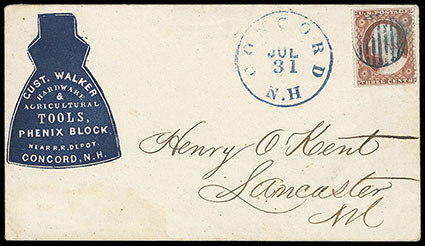 Walker, Hardware & Agricultural Tools, Concord, N.H., blue illustrated cameo corner card in the shape of an Axehead, on cover franked with scissor separated 1857, 3¢ rose, type I canceled by blue grid handstamp, matching "Concord, N.H., Jul 31" cds alongside, Very Fine. Scott No. 25 Estimate $200 - 300. (Cameo) H.T. 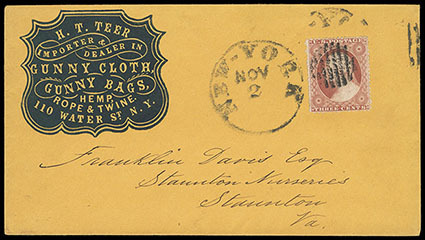 Teer, Gunny Cloth, Gunny Bags, Hemp, Rope & Twine, blue fancy shield corner card on fresh cover franked with 1857, 3¢ dull red canceled by "New York, Nov 2" cds and grid duplex, Very Fine. (Cameo) J. 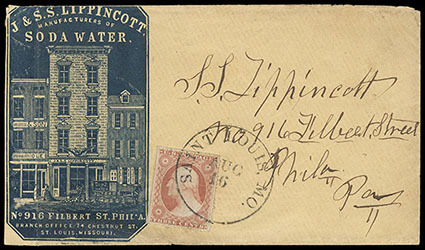 & S.S. Lippincott, Manufacturers of Soda Water, St. Louis, blue illustrated cameo corner card showing Philadelphia building on buff cover bearing 3¢ dull red (26) tied by "Saint Louis Mo., Aug 16" cds from branch back to main office in Philadelphia Pa.; light fold at left and some edge wear, Very Fine and attractive. 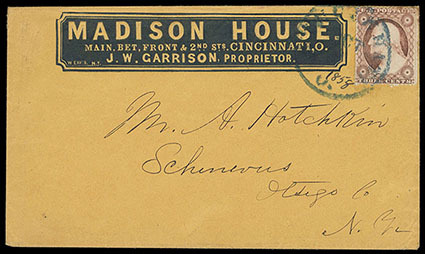 (Cameo) Madison House, Cincinnati, O., hotel corner card on cover franked with 1857, 3¢ dull red tied by blue Cincinnati, O. cds with manuscript 1858 year date, Very Fine. (Cameo) Minehill & Schuylkill Haven R.R. 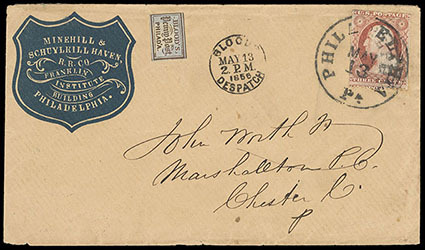 Co., Franklin Institute Building, Philadelphia, blue sheild corner card on cover franked with 1851, 3¢ dull red tied by "Philadelphia, Pa., May 13" cds, in combination with acid canceled Blood's 1854 (1¢) bronze on lilac with "Blood's Despatch, May 13, 1856" cds alongside, Very Fine and choice. Scott No. 11+15L14 Estimate $200 - 300.